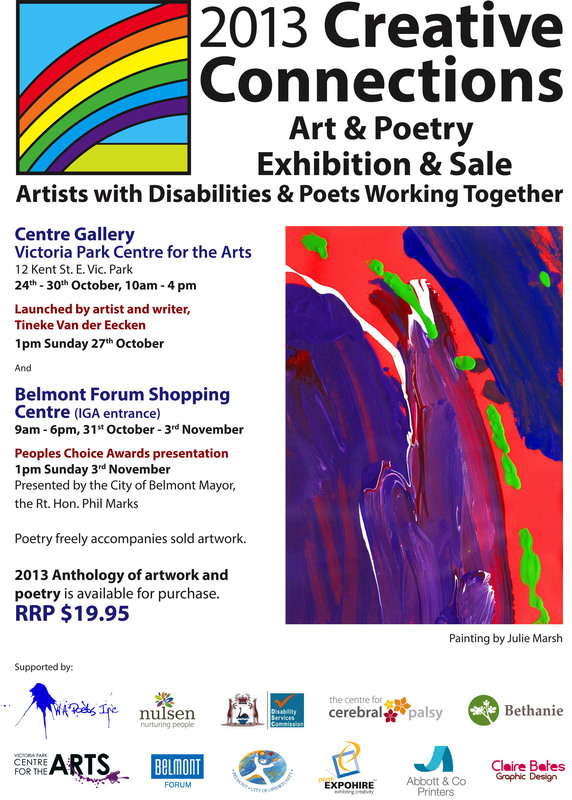 The Creative Connections Art & Poetry Exhibition presents artwork by people with disabilities. The art can range from raw, random brush strokes to deliberate compositions making full use of colour, shape and form. The intellectual and often physical disabilities of most of the artists involved in this Exhibition preclude them from many of the usual avenues of community access resulting in their art often not being accessible beyond immediate carers and family. As most of the artists are non-verbal, creating artworks can often be their only means of communication. The Exhibition provides the artist with a vehicle to become included in the general community. In it’s seventh year, this exhibition moves Creative Connections into a new phase with it’s first showing at the Centre Gallery (Victoria Park Centre for Arts) as well as it’s continued public presentation at Belmont Forum. This coupled with a successful grant application to Community Arts Network WA to facilitate Art Skills Development workshops for selected artists has resulted in an obvious increase in artistic standard and development among the artists. The enthusiasm and willingness to experiment is evident in the range of artwork presented. Whilst there are a few compositions that depict recognizable subjects there is a greater sense of appreciation for form and colour in the predominantly free flowing and unconstrained compositions. Each year brings new challenges to interpret the artwork and present an honest appraisal of the artist’s intent. It is only by delving into the portrayals of colour and form, by following each brush stroke and holding the profile of the artist in mind that words that form into a poem can be conceived. The insight draws on the poets’ own experiences to give an interpretation that is unique and ideally resonates with the artist and the artwork. The greatest benefit of Creative Connections is that it allows networking and sharing, not only between artist and poet, but also between the many similar, but distinct service provider organisations. Communication beyond regular pathways often results which can lead to new opportunities for artists and providers.